Charles T. Yerkes acquired the traction company of the North Chicago Street Railroad Company in 1886. The company was the dominant operator of horsecars on the north side of the city, but it had been inhibited from laying cable by the Chicago City Railway’s exclusive rights to trust patents in Chicago. As in Philadelphia, the top-grip technology offered freedom from the trust, and the prospect of cheap installation. Originally, Whitton laid out a single cable from the loop powerhouse at LaSalle and Illinois, running west on Illinois, then north on Wells for about 150 feet to a terminal sheave, where it reversed, ran back along the same route, through the tunnel, east on Illinois, and north another 150 feet. On opening day of the service 26 March 1887, it was discovered that only about one out of four cars could roll around either of the let-go curves at La Salle and Illinois, unaided. The company had to station a team of horses to haul the top-grip cars to their pick-up points. The team, frightened by the crowds on opening day, dashed into a cluster of spectators rolling several in the mud. The loop cable, which made 14 turns, and had grades of 7% on the tunnel approaches, had a life expectancy of about a month. The company has three power-houses, one located at the corner of Clark and Elm streets, a second at the corner of Lincoln and Wrightwood avenues, and a third at the corner of La Salle avenue and Illinois street. 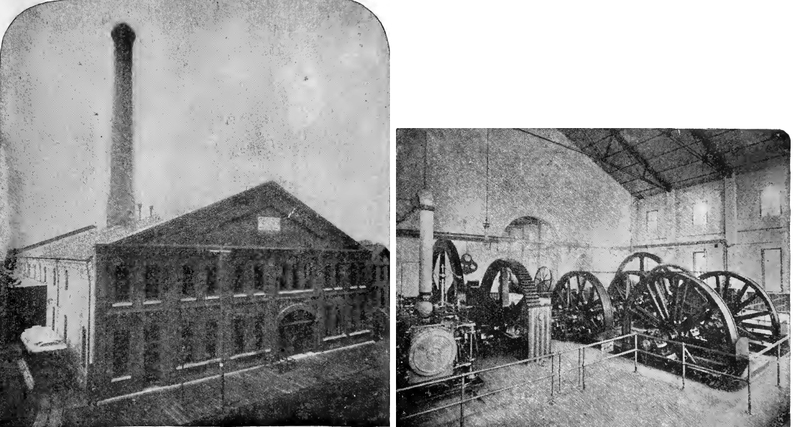 At the La Salle avenue station there are two Corliss engines of 300-horse power each, one set of driving machinery and five boilers, and the dynamos which supply the light for the station, tunnel and cars. This nest of machinery and power is used for the cable in the tunnel and the down-town loop, which is 12,500 feet long. On account of the heavy service this particular piece of cable has to perform, the wear on it is very great, hence it has to be frequently renewed. It was some time before its life could be determined ; experience, however, has fully demonstrated the fact that th appearance of the loop cable entirely fails to indicate its actual condition. It may be, for instance, that only a few strands are broken, but at the same time the material is often badly crystalized, and liable to go to pieces at any moment. The Clark Street Station is the central or main station, and is a model of neatness and order. It contains four Corliss engines of 500-horse power each, four sets of cable-driving machinery, eight massive boilers, and the fuel is handled by an elevator worked by a link belt apparatus. These engines drive three distinct cables, the combined length of which is about 56,500 feet. One of them runs on Clark street north to within 150 feet of the limits car-house and returns, and is 22,700 feet long; the second cable runs south on Clark street to within 150 feet of Illinois street and returns, being 9,200 feet long; and the third cable runs from the power-house through a subway on Clark street to Division is red, and on Division to Wells street, north on Wells street to the intersection of Clark and Wisconsin streets, where it passes around a large drum and returns to a point 150 feet north of Illinois street, around another drum, back to Division, through the subway, and to the power-house, the cable being 22,000 feet long. La Salle street, from Randolph street to Monroe street (single track). Monroe street, from La Salle street to Dearborn street (single track). Dearborn street, from Monroe street to Randolph street (single track). Randolph street, from Dearborn street to La Salle street (single track). La Salle street (and avenue), from Randolph street (through tunnel from near Randolph street to near Michigan street) to Illinois street. Illinois street, from La Salle avenue to Clark street. Clark street, from Illinois street to car barns at southwest corner of Dewey (first street south of Diversey street) and Clark streets. South of Illinois street at La Salle avenue — same as Clark street line. Illinois street, from La Salle avenue to Wells street. Wells street, from Illinois street north to Clark street. Northwest of Wells street at Clark street — same as Clark street line. South of intersection of Wells street and Division street — same as Wells Street Line. Division street, from Wells street to Clybourn avenue. Clybourn avenue, from Division street to power house at Cooper street (about 300 feet southeast of intersection of Clybourn avenue and Ashland avenue). 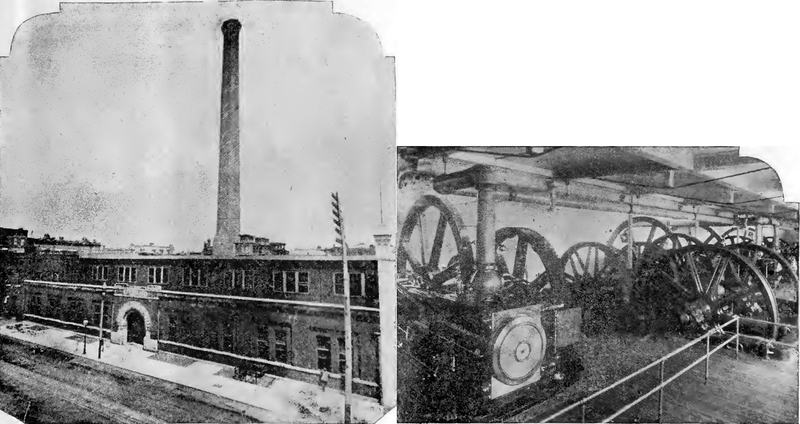 The Lincoln avenue power station contains two Corliss engines of 300-horse power each, six boilers and two sets of driving machinery, and the plant is used to move the Lincoln avenue cars between the junction of Centre and Clark streets and Wrightwood avenue, the cable for the purpose being about 18,000 feet long. South and southeast of intersection of Clark street and Wells street, cars interchange between Clark Street Line and Wells Street Line. Clark street, from Wells street northwest to Center street — same as Clark Street Line. Center street, from Clark street to Lincoln avenue. Lincoln avenue, from Centre street to Wrightwood avenue. The cars operated on the several lines all make a circuit through the oar-houses at the northern terminus—going in from the righthand track and coming out on the left—which avoids the delay and confusion incident to the use of horses and the turning and switching of cars. The cable on these lines weigh over 75 tons, and the entire mass is driven past a given point, supposing the cable to be continuous, once in about every sixty minutes, carrying with it nearly one hundred cars which are very often heavily loaded. This, however, fails to convey anything like an adequate idea of the service performed by the engines, or even the cable, for there is scarcely a way of computing the extreme tension emergencies often create, nor yet of estimating the exactions of such extraordinary duty on machinery used as this is. It is enough to say, perhaps, which cannot be too strongly emphasized, that both the cable and the power have been found ample, and they have not only worked satisfactorily, but have best answered the charge against the company that it was dealing in cheap and inferior things. The machinery has proved without a flaw, and not a single break-down has occurred at the power stations, which is a remarkable circumstance, especially where so great a service has been demanded; and, so far as the main cable is concerned, by which is meant all north of Illinois street, the company could not have asked for better results. There have been very few breakages, and the delays on account of the cable proper have scarcely been worth mentioning. It is true that, before the Lincoln avenue line was started, there was considerable complaint growing out of the delay incident to transferring and the massing of cars at the intersection of Clark and Centre streets, but it was not chargeable to the cable system, and disappeared the earliest possible moment the cause could be removed. In other words, there has been nothing in the operation of the main cable which has not been assuring, and while the company has regretted more than its patrons possibly could the delays and vexations growing out of the starting of new machinery, it congratulates itself that it has been so heartily sustained by public faith in its constant endeavor to right wrongs, correct shortcomings, and serve its patrons in an entirely satisfactory manner. Old Cars Splintered and Smashed by Relic-Hunters on Final Trip. CHICAGO. July 22. —State street bade an unregretful farewell to the last cable train of the Chicago City Railway Company this morning in the dark and early hours when good people were asleep and the roysterers were enjoying their fling. Groaning and wobbling as one decrepit and having earned a long rest, the final cable train rattled and bumped around the loop and swung into position for its “positively last performance” at 1:35 o’clock a. m. The train consisted of a battered grip car and a twenty-year-old trailer. 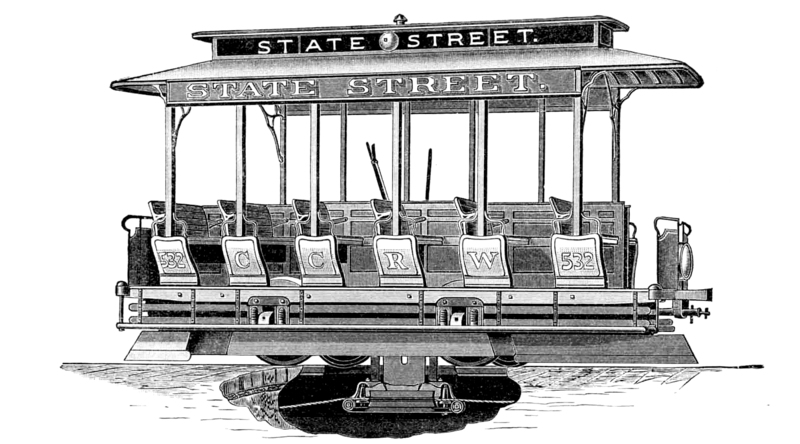 Just behind it moved the first real State street trolley car, belated forerunner of faster transportation. Can you tell me where you got the photo of the Lasalle Street powerhouse?